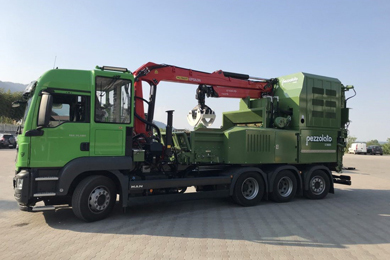 After several years of “break” dedicated to the construction of shredders / hammer shredders for medium / small composting plants, Pezzolato re-proposes the S18000 model driven by a 545 Hp Iveco C13 engine. The rotor, equipped with 62 mobile hammers, has one meter in diameter and is 1800 mm wide. Set up on a MAN TGS 35 500 truck, the car is powered from the truck cab with a 10.4-meter Palfinger Q130LD104 outrigger crane. 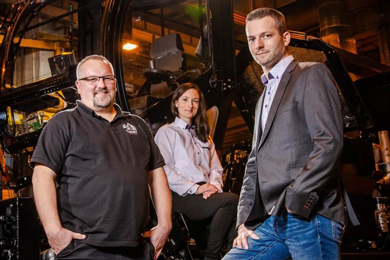 To move into the working position the S18000 crumbles rotates on a thrust bearing and slides on the truck frame. The operator’s driving position is sliding to allow the machine to be powered from both sides.